Our home for this retreat is a beautifully restored, craftsman home in the prestigious Shaughnessy neighbourhood. It has even been recognized by the City of Vancouver as a heritage home. The historical architecture was preserved beautifully through high ceilings, original hardwood floor, fireplaces, and wall-fabric. Vancouver is, in my opinion, one of the most beautiful locations in Canada. It is among Canada’s densest, most ethnically diverse cities. A popular filming location, it’s surrounded by mountains, and also has thriving art, theatre, and music scenes. Vancouver is consistently named as one of the top five worldwide cities for livability and quality of life. During this retreat, I will introduce you to many of my favorite spots in Vancouver. We will also take a short day trip to Whistler where we will witness the bears coming out of hibernation and a ferry ride over to Victoria. We will be relaxing as we get over jet lag and settle into our new environment. 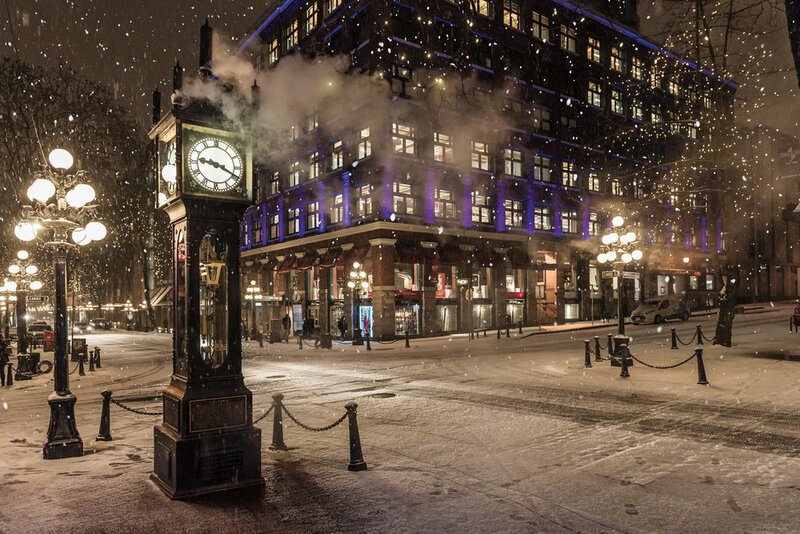 This afternoon we will take a nice stroll through Gastown known for its whistling Steam Clock and mix of souvenir shops, indie art galleries and decor stores in Victorian buildings. We will then head back to the house for a relaxing dinner and some study to prepare for our outing tomorrow. The Wild Whales experience allows you to observe whales and the diverse wildlife of the Pacific Coast in their natural habitat. It is an unforgettable, trip of a lifetime! Afterwards we will explore Granville Island and enjoy a meal at the Keg. We won’t just walk through the park, we will start our visit of Stanley Park by Horse-Drawn Carriage. We will then have lunch overlooking the Lions Gate Bridge. From here we will spend the afternoon walking through the park and visiting other sites such as Siwash Rock, the Stanley Park Hollow Tree and so much more. About 60 black bears come out of their long winter hibernation in Whistler and we will get a chance to see them. While here we will also visit Squamish Lil’wat Cultural Centre and enjoy indigenous inspired food for lunch such as a smoked salmon bannock panini, bison pot pie, and venison chili. After lunch we will get a unique perspective of the mountain town and the surrounding alpine scenery, as we soar above it all on the Sea to Sky Gondola ride. Once we arrive at the top, there is much to explore. We will take a walk on one of the nearby hiking trails and check out the 100m long Sky Pilot suspension bridge and the 465 sq m viewing platform, both of which offer stellar views. We’ve had a few long days so time to slow things down a bit. Today we will enjoy a relaxing walking tour of VanDusen Botanical Garden before group cooking and game night. Today we will take the ferry over to Victoria and enjoy all of it’s beauty. Spring is quite possibly the most pleasant time to tour Victoria as the winter frosts give way to cherry blossoms and azaleas everywhere. While here we will enjoy a delicious lunch on the water and a quick visit to the BC museum. After our classroom time, we will start the day with a walk along Jericho Beach to enjoy the beach and feed the local rabbits. That’s right rabbits! We will then head back to the house for lunch and some more classroom time. Vancouver has the third largest Chinatown in the world, so we will head out here in the afternoon to discover all the shops and merchandise as well as dinner at one of the most popular restaurants among Vancouverites. This is an island full of buskers, artists and performers. Since we only had time for a quick glimpse of it on day 2, today we will return to really take the time to discover a few of the many art galleries which highlight the incredible artwork of local First Nations. From here you will go your own way to test your new language abilities and complete a few challenges you will receive at breakfast. YOUR DAY! Today you get to make the schedule and decide what we will see and where we will eat. This is the day to bring everything together and not only plan the day but also act as my guide.